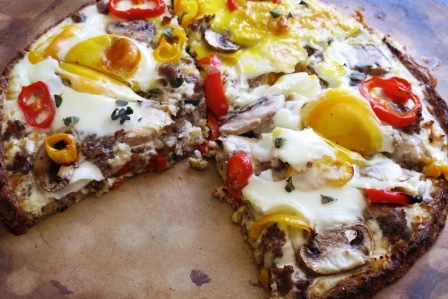 Breakfast pizza is something I grew up eating. My father is a great cook, though he mainly keeps to meat and breakfast for his repertoire. Somewhere along the line when I was young, he started finding all kinds of recipes that he would make on Sunday morning or for holidays. 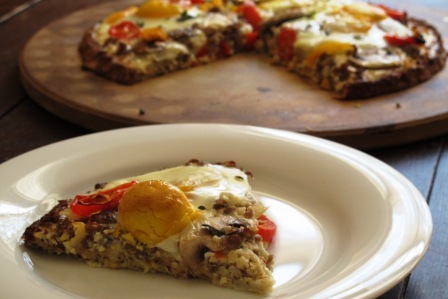 Breakfast pizza was one that stuck with us and is a family favorite. His recipe is fairly similar to the one on the back of a Jimmy Dean sausage package, minus the potatoes. 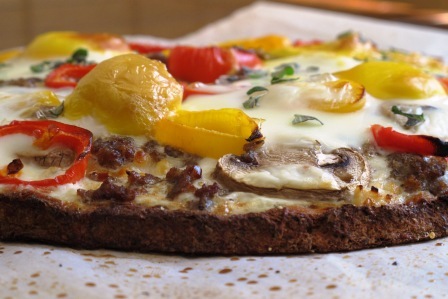 When I saw the Build a Better Brunch recipe contest on Healthy Aperture, I just knew I had to do breakfast pizza. After much thought, I decided I couldn’t redo my dad’s recipe. It just didn’t feel right. So I created my own, capitalizing on the cauliflower pizza crust trend that is running rampant on Pinterest and blogs all over the internet. I had been wanting to try it and thought this was the perfect opportunity for it. After researching around, I adapted this cauliflower crust recipe (if you want great picture by picture instructions on how to make the crust, this is an excellent post), and I must say the results blew me away. My mother-in-law couldn’t believe it. I love cauliflower but the rest of my family does not. They didn’t even know what hit them with this one! And both my 4 year old and 14-month-old gobbled it up. Occasionally sneaking in an extra vegetable is okay in my book. 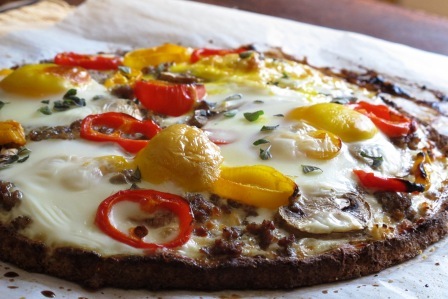 Pizza can take on a healthy spin for brunch. Swap out a bread crust for a cauliflower one and you'll be amazed at how good it turns out and sneak in one more serving of veggies. It looks like a lot of steps, but it really comes together quickly. This would be an easy recipe to double and have a party with people making their own with their favorite toppings. Preheat oven to 425 degrees F. Put a pizza stone or pan in oven to heat. Put cauliflower in a bowl, cover and microwave for 4 minutes. Dump cooked cauliflower onto a clean dish towel and allow to cool. Once cooled, ring out as much liquid as you can from the cauliflower. The more liquid you get out, the better the crust will be. I drained out almost ¾ cup of liquid. Put the drained cauliflower into a bowl. Add the remaining crust ingredients and mix well with your hands. On a piece of parchment paper coated with cooking spray, pat out the cauliflower mixture into the pizza crust. Pack as tightly together as possible while you form the crust. You want to make it thin, but not too thin. I got it to about a ¼ inch thick, though in retrospect I would probably make it a little thinner. Make a ridge around the outer edge with your fingertips. Carefully transfer the parchment paper with the crust to the heated pizza stone. Bake the crust for 10-12 minutes, or until golden brown. While crust is cooking, assemble your pizza toppings. Once crust is browned, remove from the oven and add your toppings. Spread the garlic on the crust first, then top with the cheeses. Next add the vegetables and the sausage. You do not want to pile on the toppings too high – keep it to as thin of a layer as possible. Last, crack the eggs over the pizza crust, spreading out the yolks as evenly as possible. Carefully put the pizza back into the oven and cook another 10-12 minutes or until eggs are set. Remove from oven and garnish with chopped fresh herbs like basil or oregano. Slice into 6 pieces and enjoy! Disclosure: This recipe was entered into the Build A Better Brunch recipe contest on Healthy Aperture. I was not compensated in any way for this post. Though if I win, (FINGERS CROSSED!!) I could win a Vitamix or a KitchenAid mixer. I really want a Vitamix!